Another interesting activity to try out in the heart BKK! Escape Hunt Bangkok is located directly across from Terminal 21 Shopping Mall in Interchange 21 Tower (the building with the huge Citibank sign covering it) which is major plus point as it is connected to both the BTS Skytrain at Asok and the MRT Underground at Sukhumvit. Public transport is strongly advised as traffic in this area is severe most of the day. To each their own, but speaking of Thai and Indian culture and genes, your ancestors and mine must have eaten with their hands for a few hundred generations before Europeans arrived on the scene. A famous Indian remarked that eating with knives and forks was akin to making love through an interpreter. I agree! I hear your banana leaf remark, but food has texture that needs to be felt, and temperature! Different rices, different fishes, different vegetables cut different prepared to different degrees of doneness in specific dishes! You lose all of these experiences, with cutlery, like looking at colors under sodium halide lamps! Not kidding, not at all trying to put you down either, in even a remote sense. You see, in India we mash certain vegetables by hand and then various species of sour limes, sqeezing the rind to extract the rind oils, then smashing the thai-type chilies to extract their heat and aromatic oils just so, each according to individual taste. Say just so much for plain hot steaming rice with just ghee and green chilies and salt, then doing the same with the preceding, mashing in steamed “small bitter gourd” that has been cooked with the rice, whoch gives it a different flavor than just boiling or steaming by itself. Then maybe calabaza pumpkin or taro. These form an entire repertoire of first courses in the Rarhi Bangali lunch. 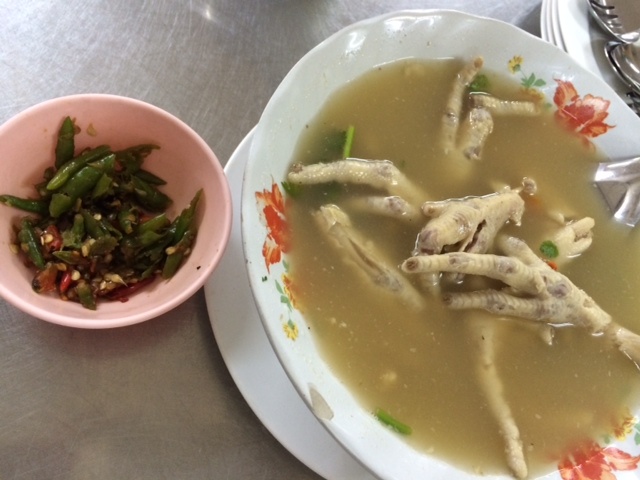 I could go on: we eat a penultimate or final dish with rice, fresh lime juice, green chilies, salt, sugar and water, maybe a hint of preserved lime pickle, all mixed up and mashed by hand. Cannot even imagine doing this by any implement. Loving hands of Mother does it best, and little children sit in a circle around her, although they have finished their lunch way earlier. Truth to tell, Mom’s often eat such stuff because nothing else is left, and they have happily served everyone, including itinerant beggars the last morsel before they will sit down themselves. Then the little one will eat up what little is left, opening their mouths wide, and Mama will pop a little wet ball into each greedy maw, in turn! Amrita! Who knows what she got to eat. These things cannot happen with the very selfish and individual chopstick and cutlery culture I am afraid, each mouth intent on greedily filling itself, intent on filling itself. If you have seen Central Asian cultures, you will have seen the high priority placed on feeding others with hands, husbands first feeding wives with hands laden with plov, and this hand-to-mouth feeding is very, VERY important in Indian culture as well. Parents feeding their children, gurus their disciples, Husbands ritually and loving feeding their wives food from their own plates, and their own hands is immeasurably significant. While we firmly eschew eating from a common plate that Muslims and Chinese favor, this particular sharing of food between intimates which emphasized ordinarily prohibited behavior actually reinforces bonds! Sort of strange, but that is the major significance of eating from a hand not your own in the Hindu culture, which the substratum of Thai culture which is religiously Buddhist and culturally semi-Hindu. The King is Rama a, b, c, d etc. not without a specific reason!! His ritual priests are solely Brahmans also for that reason! Not a defense for eating by hand, but just suggesting its very, very deep roots in Thai culture and their antecedents. Not so in Vietnam, but certainly in Thailand/Shyamadesha, the Verdant Land, and Myanmar/Brahmadesha, the Land of Celestial Beings. No accounting for taste! Perfect example! I can’r do the feet or offal – but Chow, how can you resist to wonderful taste of mangosteens? Couldn’t you eat them in private and spit the pips into a bucket? I know. But it explains why I always need utensils, right? 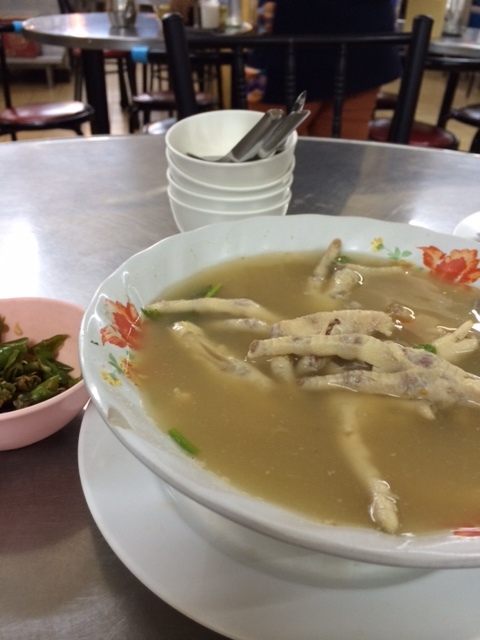 Your husband was the first person I ever saw eat chicken feet, and I remember being so impressed by how he worked off all the meat inside his mouth and spat out clean, dry bones in the most elegant way. Yes, he is really good at that.